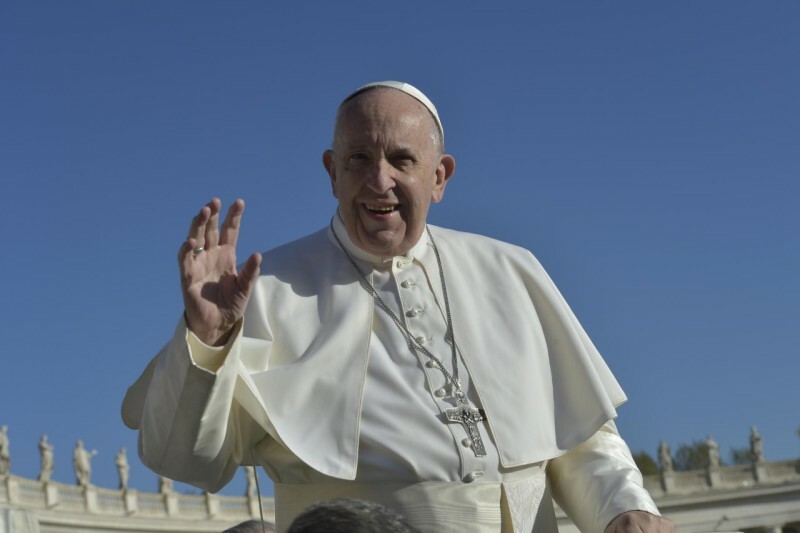 Pope Francis continued the series of catecheses on the Commandments, in his address in Italian the Pope focused his meditation on the theme: “Do not covet another’s spouse; do not covet another’s goods” (Biblical passage: From the Book of Exodus, 17), at his General Audience on November 21, 2018. After summarizing his catechesis in several languages, the Holy Father expressed special greetings to groups of faithful present. Then he invited to remember Religious Cloistered Communities on the occasion of the Day Pro Orantibus, which is observed today. Our meetings on the Decalogue lead us today to the last Commandment. We heard it at the opening. These are not only the last words of the text but much more: they are the fulfillment of the journey through the Decalogue, touching the heart of all that has been given to us in it. In fact, in hindsight, they don’t add a new content: the indications “do not covet the wife [. . . ] or anything that belongs to your neighbor” is at least latent in the Commandments on adultery and on theft; what, then, is the function of these words? Is it a summary? Is it something more? Let us keep very present that all the Commandments have the task to indicate the boundary of life, the limit beyond which man destroys himself and his neighbor, spoiling his relationship with God. If you go beyond, you destroy yourself; you also destroy the relationship with God and the relationship with others. The Commandments point this out. Highlighted through this last Word is the fact that all transgressions stem from a common interior root: evil desires. All sins are born from a wicked desire — all. The heart begins to move there, and one enters that wave and ends up in a transgression. But not a formal, legal transgression: it’s a transgression that wounds oneself and others. The Lord Jesus says it simply in the Gospel: ”From within, out of the heart of man, come evil thoughts, fornication, theft, murder, adultery, coveting, wickedness, deceit, licentiousness, envy, slander, pride, foolishness. All these evil things come from within, and they defile a man” (Mark 7:21-23). We understand, therefore, that the whole journey undertaken in the Decalogue would be of no use if it didn’t arrive at touching this level: man’s heart. From where are all these awful things born? The Decalogue is lucid and profound on this aspect: the point of arrival — the last Commandment — of this journey is the heart and if this, if the heart isn’t freed, the rest is of little use. This is the challenge: to free the heart from all these wicked and awful things. God’s precepts can be reduced to being only the beautiful facade of a life, which in any case remains an existence of slaves and not of children. Often, behind the Pharisaic mask of asphyxiating correctness, something awful and unresolved hides. Instead, we must let ourselves be unmasked by these Commandments on desire because they show us our poverty, in order to lead us to a holy humiliation. Each one of us can ask him/herself: but what ugly desires come often to me? Envy, greed, gossip? — all these things that come to me from within. Each one can ask him/herself and it will do him/her good. Man is in need of this blessed humiliation, that <humiliation> by which he discovers that he cannot free himself on his own; that <humiliation> by which he cries to God to be saved. Saint Paul explains it in an insuperable way, precisely in referring to the Commandment not to covet (Cf. Romans 7:7-24). It’s vain to think that one can correct oneself without the gift of the Holy Spirit. It’s vain to think we can purify our heart in a titanic effort of our will alone: this isn’t possible. It’s necessary to open oneself to a relationship with God, in truth and in freedom: only thus can our efforts bear fruit because it’s the Holy Spirit that leads us forward. These are the ones who are able to have compassion, who are able to have mercy on others because they experience it in themselves. I’m happy to receive the groups of faithful of parishes, especially those of Sant’Elpidio a Mare and of Salerno; and the group Laboratory of Courage, accompanied by the Archbishop, Monsignor Renato Boccardo. A particular thought goes to young people, the elderly, the sick and newlyweds. Today we celebrate the Memorial of the Presentation of the Blessed Virgin Mary. We look at Her who generated Christ and we venerate Her as Mother and powerful Help of Christians. From Her, we learn what it means to be entirely consecrated to the plan God has for each one of us and for the whole world. Today, liturgical Memorial of the Presentation of Mary Most Holy in the Temple, we observe the Day Pro Orantibus, dedicated to remembering Cloistered Religious Communities: there are so many! It is an occasion all the more opportune to thank the Lord for the gift of so many persons that, in monasteries and hermitages, dedicate themselves totally to God in prayer, in silence, and in hiddenness. May these Communities not lack the affection, closeness, and support, also material, of the whole Church!